My dad was in the armed forces, so we traveled a lot while I was growing up. My family crisscrossed the country from east to west coasts, and from the far-north down into the U.S. a dozen times. We saw a lot of this marvelous land, traveling from posting to posting - more than most kids my age ever got to see. Now, family travel is far more common, with many families hitting the highways every summer in search of family fun and adventure. One of my favorite places in the whole world has always been the lower mainland of British Columbia. 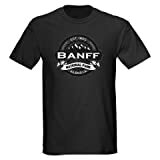 I don't live there now, but I still love to visit, because the lower mainland has some awesome scenery, and some great, family-friendly travel destinations. My last trip to Golden Ears Provincial Park was over my Christmas holiday. We went for long walks through the towering trees, marveling at the rain forest giants. The weather was brisk at the start of our adventure, but the early morning overcast soon gave way to a lovely sunny day. We spent the morning strolling along some of the well-marked trails, past ancient giants, and even more ancient remains - stumps left by loggers of old. Seeing the size of some of those stumps, we were amazed that anyone would have scaled the heights of those trees to top them off and remove the trunks - it would have been no small feat with modern equipment, let alone using the climbing spurs and hand axes of old. Whoever took out those trees were mighty loggers indeed. Where is Golden Ears Provincial Park? 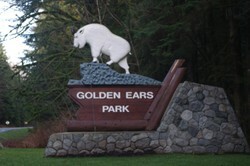 Is Golden Ears Park close to any towns and amenities? One of the attractions of Golden Ears is its proximity to local facilities. Not only is the park a huge draw for its clean beaches, nature trails and family-friendly activities, but its location, close to shopping and lodgings, help to make it a choice all-season travel destination. A short, half-hour drive from the charming, bustling town of Maple Ridge will take you to some of the most beautiful walking trails in the lower mainland. Even in mid-December, during my last visit, the forest was lush and green, full of fresh, verdant ferns, with some winter-hardy berries adding splashes of color. The rustic walking trails were the only evidence of humans among the mighty trees that rose up all around. The years-thick carpet of fallen needles softened the sound of our footfalls to a quiet scuff, the only sounds breaking the silence. Huge stumps dotted the forest floor; their moss covered sides and hollowed trunks mute reminders of long-dead giant evergreens. Some stumps showed chain marks and deep notches, scars left in them by loggers who cut the forest giants so long ago. At times, the silence was as profound as if we had found our way into a forest cathedral, with rays of celestial light filtering through the trees - God’s own stained glass windows. then, the path would dip and turn, and we would find ourselves in a wooded dell with a clear stream bubbling through its heart. At such times, it was easy to imagine we’d been magically transported to some unknown realm. I hadn’t expected much company on our ramble, but the good weather and scenic trails proved to be a magnet for other visitors. Soon, it seemed at every turn we’d meet laughing groups of hikers. Families with young children, dogs in tow, greeted us, sharing our joy in the day, and the beautiful paths. A number of great hikes and trail rides are available in Golden Ears Park, ranging from easy meanders along the many well-marked trails to more challenging hikes of several hours, some as long as 12 and 15 kilometers. There is a walking trail for almost every level of hiker in Golden Ears Park, from our casual strolling rambles to trails for the more hard-core adventurer. The hikes into Mike Lake and Menzies Trail include trails for horses and cyclists, and can be accomplished in a few hours, while the return trip along the Alouette Mountain Hiking Trail takes 9 - 10 hours, and is recommended for experienced, well-equipped hikers. All in all, Golden Ears Provincial Park is full of amazing scenery and great walking trails. As well, in both the off-season and in the summer it offers great opportunities for family recreation. Only a half an hour away from major centers, it offers adventure and accessibility to activities the whole family can enjoy. Be sure to make it one of your summer travel destinations this year! Thanks so much tolovaj! I am trying to encourage Enelle to write a fantasy story about the park, so your comment is too cool! ...and it changes with every season, too, doesn't it, Enelle? Gotta love such an amazing place. Another of my favorite places :D Even though we walk the same trails quite regularly, they always look different. There is always something new to see around the corner. My husband and I enjoy hiking -- Golden Ears Provincial Park looks like a beautiful place for visiting and hiking along the trails!